On Tuesday, Tennessee Athletics Director Phillip Fulmer provided some clarity along with men’s basketball coach Rick Barnes on a wild Final Four weekend. Over that weekend, it was revealed publicly that UCLA was courting Barnes to be their next head coach, and Barnes was very interested in the position. Ultimately, however, Barnes elected to stay at Tennessee and signed a new deal with UT. In what was a wild 48 hours, Tennessee fans everywhere held their breath, anxiously waiting for updates on Barnes and UCLA’s job offer. After some back-and-forth, Barnes signed a new deal with Tennessee, got a significant raise, and received some extra benefits such as use of a private plane. But when all was said and done, Barnes made it clear that Tennessee was a special place first and foremost, and he wanted to be here. Fulmer, who was very vocal on his attempt to keep Barnes at Tennessee, had a very busy week in athletics when he got the news of Barnes and UCLA. 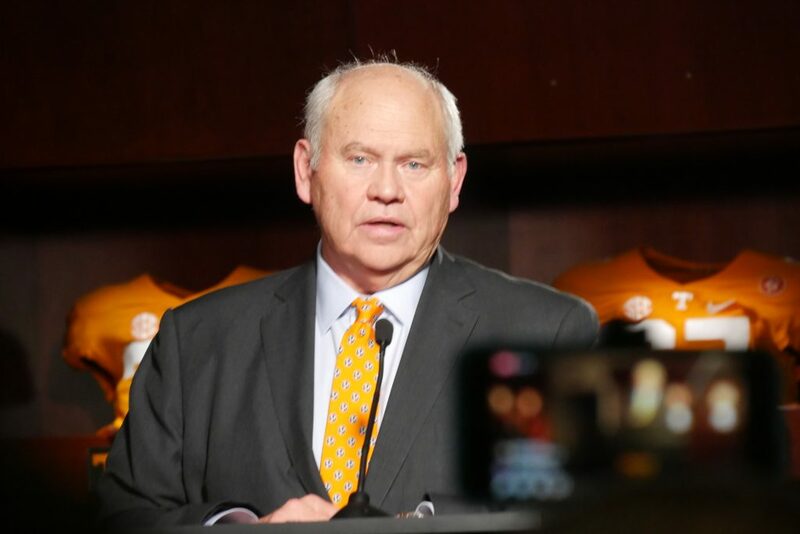 Fulmer received the good news that Barnes was staying on Monday night, and Vol nation heard the news during halftime of the National Championship game. But that whole day was a stressful one for him. Both Barnes and Fulmer could see both sides of the decision, and both were full of emotions. It was evident the history of UCLA played a huge factor in Barnes’ consideration. Fulmer knew that he was up against a rich and historic program, and that led to a lot of apprehension on his part. “He was so honest and upfront as to how he felt, and growing up a John Wooden fan, like all of us, I guess, my age and around his age did,” Fulmer said of Barnes. “What UCLA represented to him from a blue blood (standpoint). It was very concerning. A lot apprehension on our part that this was real. Ultimately, UCLA’s inability to handle Barnes’ $5 million buyout was the key determining factor, but Barnes also wasn’t looking to jump at the first opportunity he could; UCLA was a blue blood and a dream job. That kind of situation could’ve driven a wedge between both Fulmer and Barnes, but the two made it clear that their relationship with each other was as strong as ever after the situation. Both men said those decisions weren’t made without talking it out with each other. The situation was stressful for Fulmer, and it wasn’t exactly a walk in the park for Barnes, either. Barnes mentioned that he “didn’t come out of (his) house for two days and (he) lost over five pounds” during the whole ordeal. It clearly wasn’t easy for either Barnes or Fulmer. But after all of the negotiations, prayers, and talking with family, Barnes shocked many when he decided to stay. The deal seemed too sweet to pass up, and many were already reporting it was close to a done deal. So what happened?